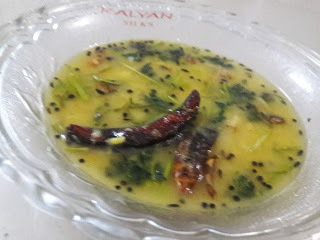 Moong dal varan is highly protein rich for vegetarians . This is healthy and simple recipe for beginners. You can make this lentils curry with all types of Lentils (dal) brown, orange, yellow lentils( toor dal, moong dal, split masoor dal) . For those who don’t like plain varan this is a good option. if u like little tangy just add raw mango (कैरी ), pearl onion etc..
Heat a pan on medium heat. Add oil. Add mustard seeds. Let it pop up. Add garlic. Fry the garlic for 1 – 2 minutes. Add curry leaves, onion and green chillies. Cook it for 4 – 5 minutes. Add tomato. Cook for 3 – 4 minutes. Add turmeric powder. Mix well. 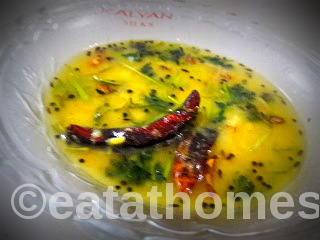 Add cooked dal. Add water if required. Add salt to taste. Mix well and bring it to boil.